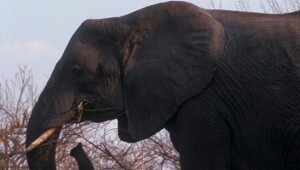 The metabolic rate–body size relationship suggests that the African elephant (Loxodonta africana) should be least selective among mammalian herbivores in its diet. However, selection among plant species needs to be distinguished from selection for plant parts or other features. We investigated seasonal variation in the selective utilization and dietary contribution of woody plant species, parts, and height classes to vegetation consumed by elephants in the Kalahari sandveld region of Chobe National Park, Botswana. Only 30% of 27 common woody species were moderately or highly acceptable to elephants in the wet season, increasing to more than 50% in the hot dry season. Six woody species remained mostly or entirely rejected by elephants throughout the year. Most of the browse consumed during each season came from 1 or 2 common shrub species. Leaves and leaf-bearing shoots constituted 80% of the material consumed from woody plants during the wet season, but only 45% during the cool dry season. Stem, bark, and root tissues contributed 50% of the woody plant component of the diet in the cool dry season, increasing to 94% in the hot dry season. Hence, despite their narrow selection for plant species, large size coupled with hindgut digestion enables elephants to exploit a wide range of plant parts, including fibrous stems, bark, and roots. Accordingly, elephants occupy a dietary niche distinct from browsing or grazing ruminants. Owen-Smith, N., and J. Chafota. 2012. Selective feeding by a megaherbivore, the African elephant (Loxodonta africana). Journal of Mammalogy 93(3):698-705.